Thank you! You will not be disappointed! This sounds fantastic! I love a good seasonal cocktail. Thanks, I think this time of year is particularly fun to drink seasonal and festive cocktails! That looks and sounds wonderful! I’m like you – I love pear, apple, and cranberry as well………..in a cocktail (that is very pretty too) it’s a huge temptation! I will! Thanks for the suggestions! This sounds good. I’ve only done fresh cranberry infusions– the dried is intriguing. The fresh cranberries are very different than dried. Since the dried cranberries are sweetened, they do not have much of the tart and tangy flavor of fresh cranberries. So it really depends on what kind of flavor you are looking for. They are both delicious, just different. This flavor combination is tasty, you should try it! Also -totally off topic- I tried a mint-infused bourbon and while it tasted pretty good (got impatient and didn’t leave long enough + maybe mint wasn’t as very fresh as it could be) it didn’t smell very good. Did you find a similar situation? Hi Jennifer, I hope you do make this! It is delicious! I’m not sure what happened with your bourbon. I made mint bourbon and I did not notice anything funny about the scent. As far as I remember, it just smelled like bourbon and mint. What kind of mint did you use? I haven’t thought about combining pear and cranberries …. but after seeing these photos….. I’m on-board! The flavors really do go well together. The dried cranberries are so much sweeter than fresh, and I think that goes better with the pear flavor. Thanks! I think you would like it! This looks delicious!! You have great recipes, and I love that you hold to seasonal ingredients! I would really like to try your recipe, it is right up my alley. However, the subject of Brandy is always a worry of mine as I don’t know much about it. Do you recommend any brand? Hi Anna, Thanks for your message. If you will just be using the brandy for infusing, then I recommend getting a mid-level brandy. I think Korbel works great, but you can certainly use anything in your price range. Depending on the liquor store you go to, the person working there may be able to help guide you to a decent one. 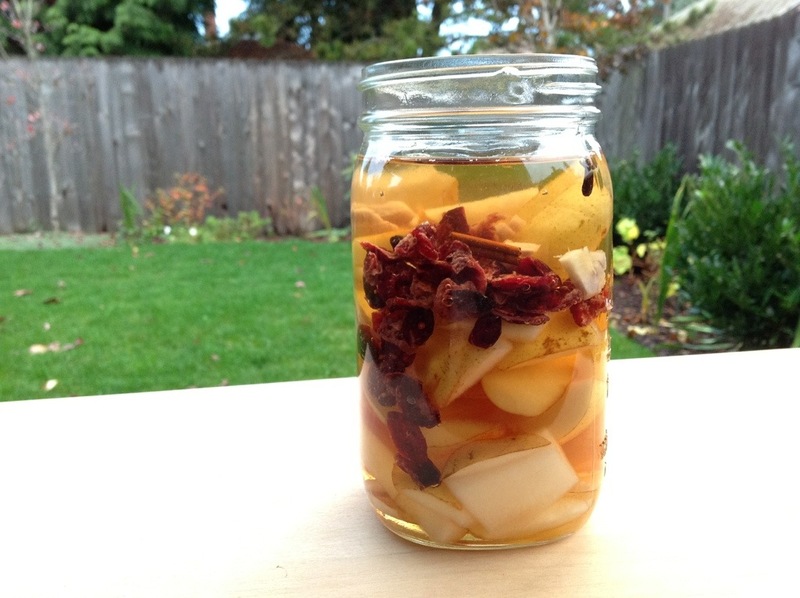 Don’t feel like you need to spend a lot of money on the alcohol you infuse with. The good stuff can be kept for drinking on its own, or other cocktails. This recipe is so cool! I am intrigued by how you’ve kept it simple, but spiced just a little complexity into it. I take my hat off to you. This may have made the “must make” list for me. About all I drink is an occasional glass of wine, but the pear and cranberry combination sounds great! Looks wonderful, a great combination of flavours. Thanks, it is very delicious! Cheers! This sounds delicious! I am eyeing my Christmas box of those Harry and David pears, which I usually scoop out of their peels… Do you think a pear peel/pit infusion would still be good if I can’t stop myself from eating the middles? I may try it and report back – I found some super cheap vodka so I have nothing to lose, haha. How did you decide to do the mix of vodka and brandy? Hi Miya, I think you could totally try to infuse with the peels and cores of your pears. As long as you have enough of the peels and cores, you should be fine. The flavor may be a bit different, but still good. As for the combination of brandy and vodka, I had seen some fruit liqueur recipes caling for a mixture of the two and started making a number of them myself. I really like the sweetness that the brandy brings, and the vodka helps ensure that it is a bit cleaner, and crisper (not too sweet or overpowering). Somehow it is just a really good combination! I did it! I used Burnett’s vodka (from trader joes…) and E&J VSOP brandy which was the second cheapest at the liquor store. I’m playing with single flavor notes right now so I did nothing but pears, just the peels and cores from most of the Harry and David box (a dozen?) 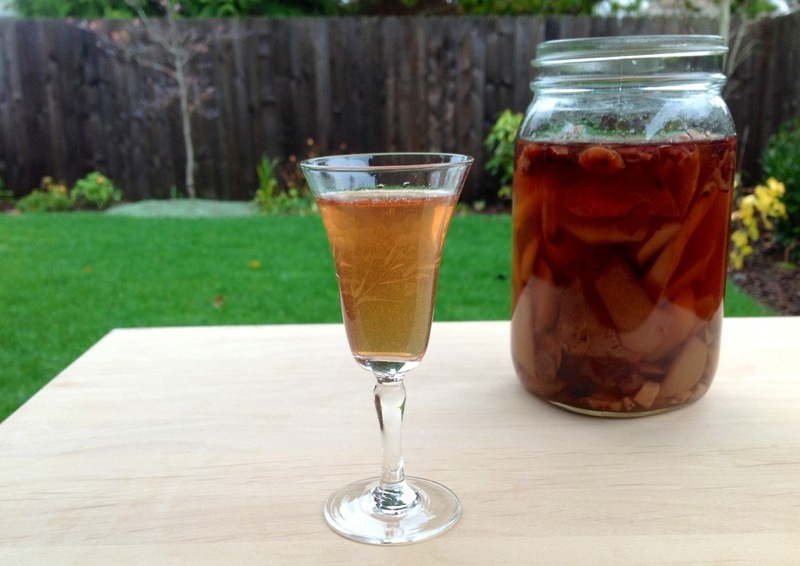 It isn’t overwhelmingly pear-y but it has a nice pear flavor, it’s pleasant to sip and I can’t wait to mix it with other things… Like maybe the allspice dram using your recipe that is sitting in my cupboard… Thanks for all the inspiration! P.S. makes me feel all thrifty even though I had to go out and buy the booze, haha! Just like my peachy simple syrup. Awesome! I love that you were so thrifty. And I just read your peach and sage jam recipe, and that sounds fantastic! Good morning, I created this wonderful liqueur. amazing aromas, ingredients blend together extremely. But we do not need a little sugar; the Constitution does not mention. if so, how much sugar to add; Thank you. 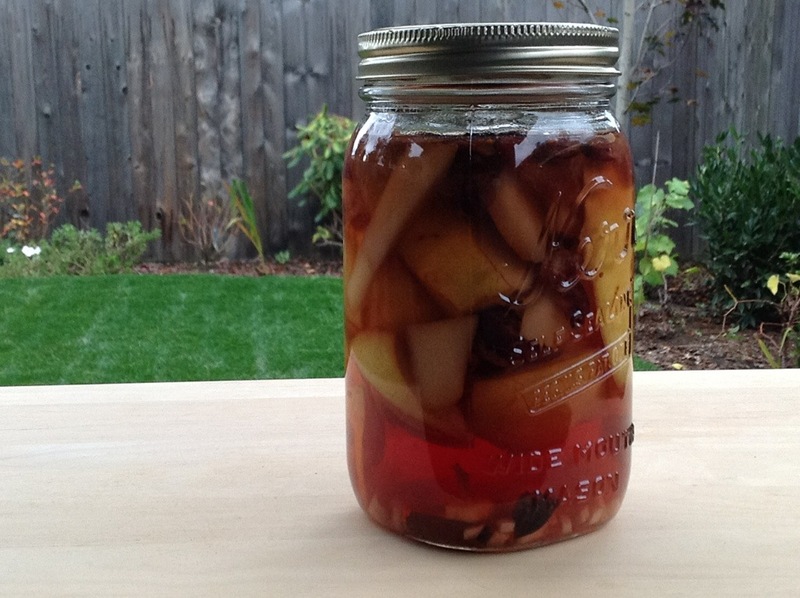 I am going to give this a try with Concord Pears. They are my new fav. =). I like the fact that this recipe doesn’t have any sugar. I have alreay started other infusions and they all sweetened.